The show starts with a short music video featuring the career of Daniel Bryan and his retirement announcement on Twitter. Stephanie is already in the ring and talks about the upcoming contract signing for te number one contender match at Fastlane. The crowd takes over with “Daniel Bryan” chants. Stephanie brings it back by talking about Triple H. She starts talking about the contract when Dean Ambrose’s music interrupts her. He heads to the ring. He asks if they can cut to the chase. Stephanie starts to reprimand Ambrose for interrupting her and for trying to tell her what to do when Roman Reigns’ music interrupts her. He heads to the ring. Reigns also wants to get the contract signing over with. They both want to punch Brock Lesnar in the face. Stephanie tries to stir the pot between Reigns and Ambrose, then she introduces Lesnar. He heads to the ring with Paul Heyman. Heyman starts to speak, but Stephanie interrupts him to a chorus of boos. Ambrose signs the contract. Reigns signs. Lesnar signs. Stephanie leaves the ring. Heyman taunts Ambrose, telling him he should ask Reigns what it’s like to get a beatdown from Brock Lesnar. Ambrose gets in Lesnar’s face, but Lesnar takes out both Ambrose and Reigns, giving an F5 to Ambrose. Triple H then comes out to the stage with the title belt. Everyone has a staring contest. Clips of Daniel Bryan on NXT in 2010 and his match against Chris Jericho. Ambrose is angry. He swears that he will get Lesnar before the night is over. Good match. Owens came out strong and kept Ziggler off-balance right from the start. Eventually Ziggler mounted a bit of a comeback and hit a Famouser from the apron to the floor. After that the match was pretty even. The ending of the match was good in that it was satisfying, but it still managed to further the feud between these guys. This definitely isn’t over, and the match just serves to build Owens’ frustrations. Clips of Daniel Bryan winning the US Title from The Miz at Night of Champions in 2010. The Dudley Boyz propose that they team up with the Usos in their tables match versus New Day tonight. The Usos seem to like the idea. An inside look at Ryback. An okay match. There was never really any doubt who would win this. Charlotte dominated with Alicia getting a little bit of momentum that was stopped short with a lame-looking spear. It felt a little like they were just going through the motions, especially Charlotte. The Miz is in the ring for Miz TV. Miz shows footage of Styles attacking him last week on RAW. Miz goes on about how Styles is ungrateful. His speech is interrupted by Chris Jericho’s music. Jericho asks Miz to shut up. He then takes over the ring and turns Miz TV into The Highlight Reel. Miz says this isn’t right. Jericho agrees. He brings out a stool and a potted plant (not the same one that Ambrose got him, but he says it is). Now it’s right. He then replays the footage where AJ Styles knocks out Miz’s tooth on Smackdown. Miz says fixing his tooth was very expensive. Plus, he had an audition with Spielberg. Steven Spielberg. He also says he wasn’t the only one upstaged by Styles. Miz plays the footage of Styles defeating Jericho in a match on RAW. Jericho says he hasn’t stopped thinking about the loss, but they’ll see who wins the next match. Styles starts to head to the ring. Miz attacks Jericho from behind, then Styles gets to the ring and he and Jericho both attack Miz. Styles and Jericho stare each other down. They throw punches until Miz drags Jericho to the floor. Jericho throws Miz over the announce table. Jericho stares at Styles as he leaves up the ramp. Daniel Bryan wins Money in the Back in 2011, then he goes on to cash in on Big Show to become the World Heavyweight Champ. Pretty good match. Ryback looks like he’s left the singlet behind, but he was back to the walking merch booth that we didn’t see on Smackdown. He also wrestled a pretty athetic, fast-paced match. I like the small changes, but the outcome still wasn’t very surprising. Good finish though. After the match, the Wyatt Family continues to attack Ryback. Bray delivers Sister Abigail on the floor. Bray talks a lot, ending by saying that the apocalypse has just begun. Clips of Team Hell No. New Day studies a table. Renee Young asks New Day if they’ve found a partner for their match. They haven’t, but they will. Because everyone loves them. Ambrose is still angry, but he doesn’t need Reigns’ help. Ambrose wants him all to himself. Reigns reluctantly agrees. The Social Outcasts say they are about to go viral. Adam Rose says the Florida Gator is about to be mutilated by the Radical Mongoose. Axel says “Radical Mongoose” is a terrible name. Rose says the universe gave him the name. Just like the universe gave Bo Dallas three best friends. Good match. This was surprisingly good. Adam Rose slapped Titus early in the match causing Titus to fight angry. We don’t usually see Titus that angry, and it really got him off his game. It was interesting to watch and made the match pretty intriguing. Summer Slam 2013. Daniel Bryan beats John Cena to become the WWE Champ. WWE honors Black History Month. Ambrose enters the ring and says that Brock Lesnar can’t keep him down. He asks for Lesnar to come out and F5 him again. He gets no response so he starts getting more and more personal until Lesnar and Heyman hit the stage. Lesnar slowly walks towards the ring with a smile on his face. Ambrose doesn’t wait. He rushes Lesnar outside the ring, but he gets beat the hell up. He takes another F5. As Lensar heads up the ramp Ambrose asks for more. Lesnar heads back to the ring, but before he can attack Ambrose, Reigns starts towards the ring. Ambrose gives Lesnar a low blow from behind and leaves the ring. Pretty good match. Rusev immediately kicks Kalisto off the apron and the League of Nations dominates the returning Sin Cara. This allows Kalisto to hit a flurry of offense off the hot tag later in the match which is good for building interest in his title defense at Fastlane. The match was pretty fast-paced. It wasn’t surprising, but it was entertaining. Earlier today, Goldust dresses as Jimi Hendrix, sort of, and smashes a guitar in order to show R-Truth what kind of a tag partner he can be. In March of 2014, Daniel Bryan supporters occupy RAW. Pretty good match. It was interesting how it played out. Sasha Banks sat back and watched and commented as Naomi helped Tamina in the match, but Becky didn’t hesitate to help Sasha when Naomi attacked her at ringside. The stuff at ringside looked pretty violent and helped put some emotion into the story. That’s really what this match was for, to build interest and emotion. Considering the lack of both of those things in the Charlotte feud, the Divas tag match is shaping up to be the far superior match at Fastlane. New Day gives Mark Henry a unicorn horn. Mark wants to play Francesca. Woods reluctantly allows him to. New Day then has a dance party with Mark Henry. New Day heads to the ring and introduce the world’s strongest unicorn, Mark Henry. Good match. It was fun. The New Day was too overbearing with Mark, so he got fed up and left. It was a nice moment. The match still went on for a bit, but the outcome was pretty expected after Henry bailed on the match. There seemed to be a little confusion between The Dudleys and The Usos. They crossed paths when they went for tandem What’s Up, and they had to move tables around for the finish because they weren’t set where they needed to be. The confusion actually worked well for the post-match shenanigans though. After the match, the Dudley Boyz turn on The Usos. They put Jimmy though a table with 3D. Bubba then powerbombs Jey from the turnbuckle through a table. Clips of Daniel Bryan’s WWE career and interviews from other wrestlers. Daniel Bryan addresses the fans about his sudden retirement. Not a bad show. I think overall the wrestling was a little so-so, but I was entertained by the totality of the show. As a side note, this was the night that Titus O’Neil grabbed Vince McMahon’s arm and subsequently got suspended. I won’t go into that here, but you can read more about what happened and my theories on the subject in the article linked here. 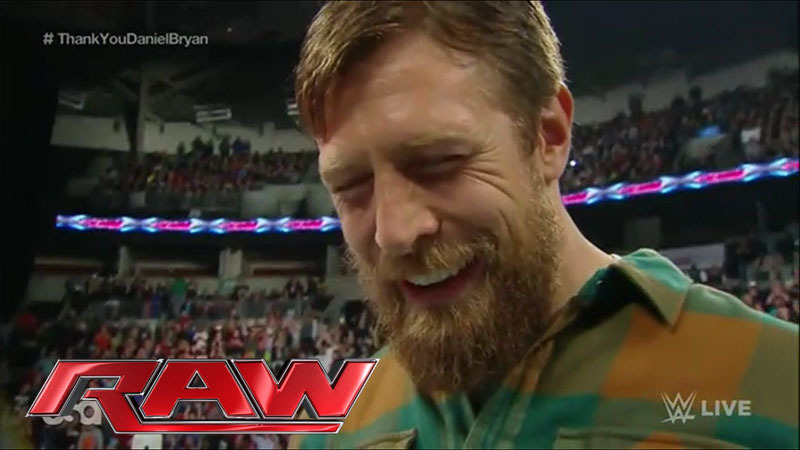 Seeing Daniel Bryan retire so young, and so suddenly, is pretty rough. I’m glad he managed to accomplish what he did in the time that he had despite the roadblocks thrown in front of him. For a while now I’ve felt like he was done in the ring, at least in a WWE ring. And given how much he seems like a WWE guy now, I figured if his was done in WWE then he was done in wrestling. After learning more about his health I’m glad he finally decided to stop. His sudden retirement feels a lot like Edge’s. But the nature of Bryan’s health issues feel far more scary. If he had continued to hide the extent of his injuries and continued to wrestle, we can only imagine how he’d end up in the future. As it is, he already might show some effects down the road. His type of issue is still so unclear as far as solid research that nobody can really say for sure. But I’m glad he’s thinking about his health and his family. I’m sure we’ll still see him around the WWE. And come on, who better to train people in Florida than Daniel Bryan? If that’s what he wants to do anyway. I think I’m going with this one tonight because it surprised me a little. I liked seeing angry Titus and I like how smart the Social Outcasts are getting in how they work matches. Other matches on the show might have been technically a little better, but the people in those matches will have batter ones than they had tonight.